One snowy night in January changes the lives of three close knit families. Fast forward to present day and once again their small Kansas town is blasted by a cold winter storm and the three families lives are altered once again. I love unreliable narrators. You're just reading along and all of a sudden you're like, what? So and so didn't mention THAT? How did that situation happen again? I also love mysteries and I also tend to lean towards more realistic fiction/mystery than the absurd. 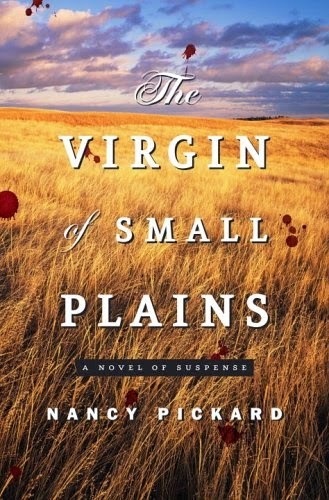 The Virgin of Small Plains by Nancy Pickard was my kind of book, until the last little bit. Then it took a turn into a ridiculous land and irritated me. Description: Small Plains, Kansas, January 23, 1987: In the midst of a deadly blizzard, eighteen-year-old Rex Shellenberger scours his father’s pasture, looking for helpless newborn calves. Then he makes a shocking discovery: the naked, frozen body of a teenage girl, her skin as white as the snow around her. Even dead, she is the most beautiful girl he’s ever seen. It is a moment that will forever change his life and the lives of everyone around him. The mysterious dead girl–the “Virgin of Small Plains”–inspires local reverence. In the two decades following her death, strange miracles visit those who faithfully tend to her grave; some even believe that her spirit can cure deadly illnesses. Slowly, word of the legend spreads. But what really happened in that snow-covered field? Why did young Mitch Newquist disappear the day after the Virgin’s body was found, leaving behind his distraught girlfriend, Abby Reynolds? Why do the town’s three most powerful men–Dr. Quentin Reynolds, former sheriff Nathan Shellenberger, and Judge, Tom Newquist–all seem to be hiding the details of that night? Seventeen years later, when Mitch suddenly returns to Small Plains, simmering tensions come to a head, ghosts that had long slumbered whisper anew, and the secrets that some wish would stay buried rise again from the grave of the Virgin. Abby–never having resolved her feelings for Mitch–is now determined to uncover exactly what happened so many years ago to tear their lives apart. Three families and three friends, their worlds inexorably altered in the course of one night, must confront the ever-unfolding consequences in award-winning author Nancy Pickard’s remarkable novel of suspense. Wonderfully written and utterly absorbing, The Virgin of Small Plains is about the loss of faith, trust, and innocence . . . and the possibility of redemption. The book switches narrators between Abby, Rex, Patrick, Verna, etc.. and gives you glimpses into the different views about that night in 1987 when everything changed. This is nice because things pop up that the last narrator neglected to share or the lies that others told each other were slowly revealed. Needless to stay, it was a bit of a letdown after having enjoyed The Scent of Rain and Lightning! Have you read The Virgin of Small Plains? Have you read any other books by Nancy Pickard? Do you like books by unreliable narrators? Which was the last good one you read?